District 1 – West Elk has clinched the district championship. Even if the Patriots lose at home to Madison they own the head-to-head advantage over St. Paul – the only team that could tie them in the standings. St. Paul can qualify as the runner-up with a win at Sedan. Sedan can nab the runner-up spot with at least an 18-point win over St. Paul. A Sedan win coupled with a Marmaton Valley loss at Southern Coffey County would also give the Blue Devils the runner-up spot. If Sedan wins by less than 18 points and Marmaton Valley beat SCC, St. Paul still advances to the playoffs as the runner-up. Marmaton Valley can tie St. Paul and Sedan with a 3-2 district record, but cannot catch them in district margin points so the Wildcats have been eliminated but may still play a key role in determining the runner-up spot. District 2 – Three teams are still in the runner for two playoff spots in District 2. Central Burden will host Oxford in a virtual playoff game. The Raiders are unbeaten in district play, while Oxford has one loss against Udall. Udall, the other team in the hunt, will be a heavy favorite at winless Flinthills. If Central Burden beats Oxford, the Raiders are district champs and Oxford’s season likely comes to an end. If Oxford pulls the upset, it will all come down to the district points margin for these three teams with the top two teams in terms of district points advancing to the playoffs. District 3 – Burlingame is the District 3 champion as the Bearcats have won their first five district games including a 48-0 victory over Clifton-Clyde in Week 6. The Bearcats host Herington this week and even if they lose they would own the head-to-head advantage over Clifton-Clyde for the district title. Clifton-Clyde is the runner-up. The Eagles have completed their district schedule and will have an open date before their first playoff game. District 4 – Defending-champion Osborne has clinched the district championship. Even if the Bulldogs lose at Lincoln they own the head-to-head advantage over Victoria – the only team that could tie them in the standings. Solomon hosts Victoria in a key game in solving the district runner-up spot. Victoria clinches the runner-up spot with a win. Even if the Knights lose they would still qualify as long as Logan-Palco defeats Bennington creating a three-way tie for second. If that’s the case, Victoria would advance by virtue of having the most marginal points. Solomon clinches the runner-up spot by beating Victoria, but only if Bennington also defeats Logan-Palco. District 5 – Central Plains has won the district title and Little River has qualified as the runner-up. Even if Central Plains loses to Goessel this week, the Oilers hold the head-to-head over Little River – the only team that can tie them in the standings. Similarly, Little River is the runner-up because even if the Redskins lose to St. John they would still hold the head-to-head advantage over both Canton-Galva and Goessel who could tie them in the standings. District 6 – Three teams are still in the runner for the two playoff spots in District 6. South Central will host Argonia-Attica in what is essentially a playoff game. The T-Wolves are unbeaten in district play, while A&A has one loss against Macksville. Macksville, the other team in consideration, will be a big favorite at home with winless Fairfield. If South Central defeats A&A, the T-Wolves are district champs and Argonia-Attica’s season is likely over. If A&A wins, it will all come down to the district points margin for these three teams with the top two teams in terms of district points advancing to the playoffs. 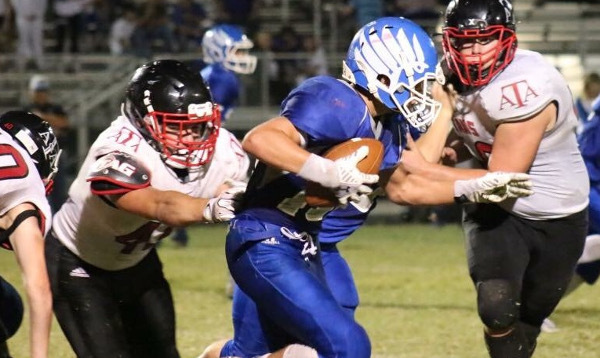 District 7 –Spearville is the district champion as an improbable Lancer loss to Kinsley will still leave them with the head-to-head tie-break over South Gray – the only team that can tie Spearville in the standings. South Gray hosts Satanta in a key game in deciding the District 7 runner-up. If South Gray wins, they are in, while a Satanta victory coupled with a Ness City win over Leoti-Wichita County would create a three-way tie for second place. qualifying as the runner-up. If that happens, it will come down to the team with the highest district points margin advancing as the runner-up. Satanta can clinch with a victory over South Gray and a Ness City loss to Wichita County. District 8 – Hoxie, St. Francis and Atwood-Rawlins County all enter the final week tied at 4-1 in District 8. There is no common winner among the three – Hoxie defeated Atwood, St. Francis defeated Hoxie, and Atwood defeated St. Francis. Barring a major upset, it will all come down to the district points margin for these three teams with the top two teams in terms of district points advancing to the playoffs. All three teams will be big favorites to win at home this week. If they all win by at least the 21-point margin, Hoxie will be the district champion with St. Francis advancing as the runner-up. District 1 – Waverly (5-0) is the district champion by virtue of its victory over Pleasanton (4-1) in Week 6. Pleasanton advances as the district runner-up by simply beating Colony-Crest this week. If Crest wins and Lebo defeats Marais des Cygnes Valley, a three-way tie would be formed for second place, but Pleasanton would advance as the runner-up based on the district points margin. The only way for Crest to qualify as the runner-up is for the Lancers to beat Pleasanton and hope Marais des Cygnes Valley upsets Lebo. District 2 – Caldwell and Hutchinson Central Christian are both 4-0 in district play and will be the district’s two playoff qualifiers. Central Christian will travel to Caldwell this week with the winner being crowned district champion, and the loser advancing as the runner-up. District 3 – Hanover and Axtell are both 4-0 in district play and will be the district’s two playoff qualifiers. Hanover will travel to Axtell this week with the winner being crowned District 4 champion, and the loser advancing as the runner-up. District 4 – Determining the qualifiers in District 4 is simple. Pike Valley is the champion having posted a 4-0 district record thus far. The runner-up spot will be decided in Beloit this week where the Rock Hills Grizzlies will take on Beloit St. John’s-Tipton. The winner of that game advances into the second playoff spot. District 5 – Last season, five teams were still alive for a playoff spot in what was a wild District 5. This season, the two playoff qualifiers are already decided as we enter Week 9. Northern Valley is the district champions by virtue of the Huskies win over Sylvan-Lucas – the only team that could match their district record in the standings. Sylvan-Lucas has qualified as the runner-up as the Mustangs hold the head-to-head advantage over both Thunder Ridge and Lakeside-Downs should either of those two teams (or both) tie Sylvan-Lucas in the standings for second place. District 6 – Hodgeman County and Otis-Bison will meet this week to decide both playoff spots in District 6. This ultra-competitive district will have two different playoff participants than last year. Last year’s state runner-up, Dighton will miss the playoff despite holding a 6-2 record entering this week’s game with Tribune-Greeley County. District 7 – South Barber is the district champ having already defeated Stafford and Pretty Prairie. The Chieftains will travel to Bucklin this week to close out the regular season. Pretty Prairie will host Stafford with the winner advancing as the District 7 runner-up and earning a playoff game at Ingalls next week. District 8 – Ingalls has clinched the district championship by virtue of a 4-0 record. Rolla has advanced as the district runner-up. The Pirates are actually tied with Moscow with a 2-1 record in the district standings, but Moscow voluntarily forfeited its district game with Ingalls in Week 5 and thus is disqualified from advancing to the playoffs. Moscow will host Rolla this week to close out the season.